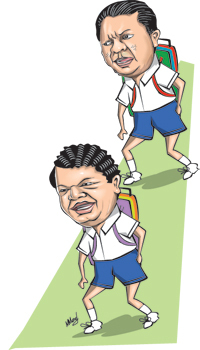 The much-awaited report sought by President Mahinda Rajapaksa from Higher Education Minister S. B. Dissanayake on the latest Z-score crisis will not be handed over to him tomorrow – a date set by the minister. �Asked when it would be ready, Higher Education Ministry Secretary Sunil Jayantha Nawarathna said it would be given to the President “soon”. The report is set to include details about those GCE Advanced Level students whose Z-score marks were reduced under a revised scheme ordered by the Supreme Court. Dr. Nawarathna said the purpose of the report was to know how many students had been affected, before deciding on a solution to the crisis or relief measures.Meanwhile, affected students and their parents continued their protests, demanding justice. Some 750 students gathered at Campbell Park in Borella following a Facebook campaign on Thursday and marched up to the University Grants Commission (UGC) office at Ward Place, Colombo to hand over a petition.An organiser of the march said the sole aim of their campaign was to demand justice and they were not driven by any political agenda. “We are not demanding new universities or the minister to go home. We simply want justice to be meted out to all these students who have come from all parts of the island,” the organiser said. An Ananda College student Thusara Geethanjana who took part in the protest said the crisis had been going on for far too long and they wanted a solution. “The students cannot be protesting or picketing every day. A solution has to be found now,” he said. Anusha Yamindika said she joined the protest to demand justice for her daughter who was qualified to enter the medical faculty according to the first Z-score result.“My daughter’s district rank was 43 when the first Z score results were released but when the revised Z-score was issued she ranked 70 and fell short of entering the medical faculty. I want justice, not only for my child but also for other children who are now distressed because of the blunders of authorities,” she said. But Ministry Secretary Nawarathne told the Sunday Times there were no updates. A fundamental rights case initiated by 33 Advanced Level students will be heard by the Supreme Court tomorrow. The students, who took the 2011 Advanced Level examination under the old syllabus, say they have been unfairly ranked at District and Island level behind students who earned lower grades taking the exam under the new A/Level syllabus. This was after a revised Z-score was released following a Supreme Court ruling. The students point out that the Court had ruled that those who took the 2011 Advanced Level Examination under the old syllabus and the new syllabus should be treated as two distinct groups and be not lumped together.